The popular OBA food truck serving delicious Brazilian cuisine will be on hand at the Back in Time outdoor concert. Come out, listen and dance to that old-time rock and roll as the Back in Time band returns for one of Gainesville’s favorite outdoor summer concerts. Featuring a 9-piece rock-n-roll band with a 4-piece horn section, Back in Time features classic rock-n-roll, soul and East Coast beach music that is sure to rock your socks off. The band brings back musical classics from the 60s, 70s and 80s with hits like My Girl by The Temptations, It’s Not Unusual by Tom Jones, Desperado by The Eagles, and of course the band’s namesake Back in Time, by Huey Lewis and the News. 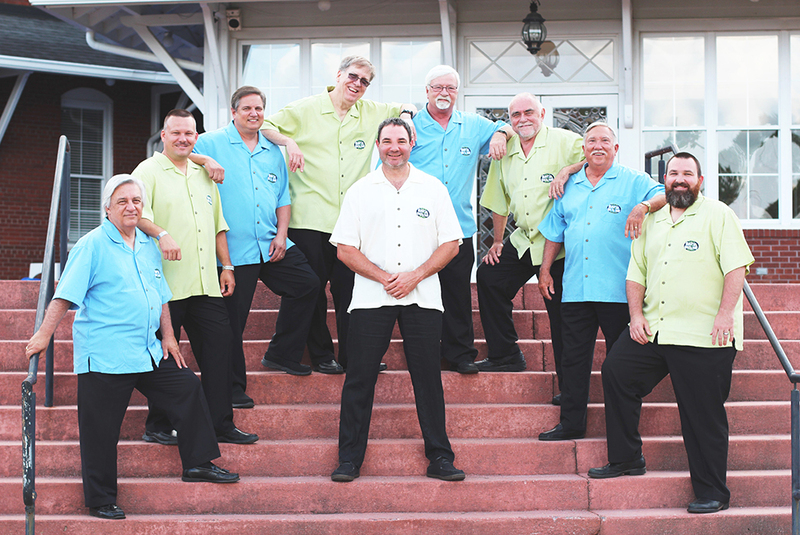 Get ready to shag the night away with your favorite partner when Back in Time performs some of the most memorable beach music classics. Back in Time was formed in the summer of 2009, becoming one of the best “horn” bands around featuring the hits of beach, soul and rock ’n roll. The core of the band came from veterans of the 1960’s and 1970’s rock ‘n roll scene in Athens and northeast Georgia. The Axemen, the Athens Rogues and Cloud Nine helped form the nucleus of Backin Time. With the addition of a talented, young lead singer, Hall County’s Singing Deputy, along with two trumpets, a saxophone and trombone, Back in Time was born. Using songs from the original artists of the 60’s, 70’s and beyond, the band put together arrangements that were true to the original recordings. Arrangements by Tom Wallace (arranger for the UGA Redcoat Band) accentuate the individual talents of the band. Band members include Jonathan Jackson – Lead Vocals, Guitar; Bob Cowles – Alto, Tenor, & Bari Sax, Vocals; Tom Wallace – trumpet, Vocals; Michael Crook – Trumpet, Percussion, Vocals; Rory Crook – Trombone, Percussion, Vocals; Mercer Crook – Keyboards, Percussion, Vocals; Glenn Brown – Lead Guitar, Vocals; John Harriman – Bass, Vocals; Chuck McKissick – Drums, Percussion.